Maria and I always look forward to hosting visitors, and we relish the opportunity to show friends around our tropical paradise. 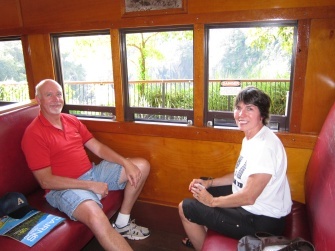 Last week, we welcomed great friends of our from Tennessee, Glenn and Shirley. We stocked the fridge with Tooheys Extra Dry, Tooheys Old and Coopers Sparkling, and enjoyed many an hour trading stories and catching up on each others’ lives over a couple of stubbies. But Glenn and Shirley didn’t travel all this way to chug beer. We made sure they experienced the best that Tropical North Queensland has to offer before sending them on their way. The weather conditions were PERFECT, so Maria took them scuba diving on the Great Barrier Reef. I’m sure she will write about that when she gets the chance. 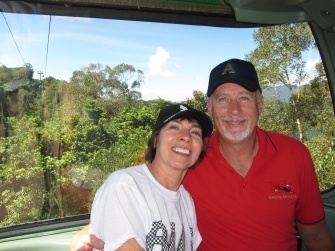 We sent them on a 4WD tour to Daintree Rainforest and Cape Tribulation, which they thoroughly enjoyed. Kuranda is home to some of the best Tropical North Queensland zoos, and we visited the famous Kuranda Butterfly Sanctuary. It was hot and humid in the massive glasshouse, but worth the visit for the thousands of colourful butterflies that were flitting around andlending on us. In the hatching room, we saw a recently hatched Hercules moth. With a wingspan of up to forty centimetres (do I still need to convert metric for you Americans?) the Hercules is the world’s biggest moth. 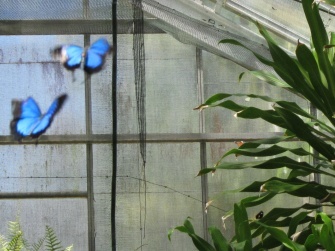 But the star of the showwasundoubtedly the brilliant blue Ulysses butterfly. Infamously difficult to photograph, the Ulysses flutters its wings at a frantic pace. I was lucky to get this - albeit blurry - show of two Ulysses in flight. 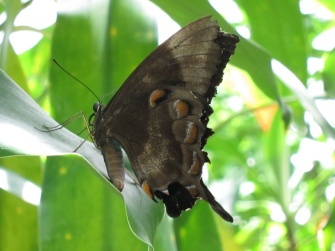 When they are stationary and have their wings closed, the striking blue colour is no longer visible and they blend in with the forest with the outside of their wings a mottly brown and grey. This entry was posted on Tuesday, April 26th, 2011 at 1:48 pm	and is filed under Tourist attractions. You can follow any responses to this entry through the RSS 2.0 feed. You can leave a response, or trackback from your own site. We certainly had a great time. In the Southern US good hosts are known for their warm Southern Hospitality. You have definitely raised the bar to a new level for Southern Hemisphere Hospitality. After reading in your blog over the past 5 years about all the wonderful sites to see and experience in Tropical North Queenland it was fantastic to finally be there in person. We know now why after all your world travels you would choose Cairns to be your home. And yes I am still confused over your metric system. In the US a “couple” means two. By my best recollection we had a few more than a “couple” stubbies. A few too many that night for sure.